Common Names: morgan, momouth, molly, stumpknocker. Preferred Habitat: Warmouths show a preference for slow-moving coastal plain streams and ponds. It seeks out submerge cover and is often found in habitats which have bottoms covered in mud and other organic material. Range: Warmouths are found in all flowing and impounded habitats in North Carolina, however, they are most productive in the coastal plain. Common Size: 5-8 inches, 3 ounces to 1 pound. Food Habits: Warmouths feed on fish, insects, crayfish, and other invertebrates. Spawning: Multiple spawns of warmouth begin in the summer months as the water temperature exceeds 70° F. Males will build nests sometimes in groups with other warmouths on top of gravel or sandy bottoms. Unlike many other fish species, the presence of limited amounts of silt does not appear to adversely affect spawning success. Females will deposit as few as 2,000 eggs to as many as 20,000 eggs into these shallow nests. The eggs are guarded until hatching and for short periods after. Miscellaneous: The larger mouth size of warmouths allows the fish the opportunity to consume a wider variety of food items than other bream species. The warmouth grows better and is more productive in coastal plain waters than in Piedmont reservoirs. Warmouths are particularly fond of submerged vegetation. 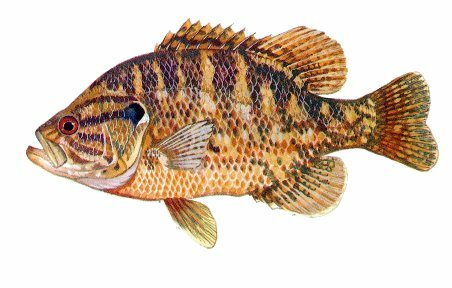 A common myth is that the warmouth is a hybrid cross between a bluegill and a largemouth bass.